Circuit Zandvoort (Dutch pronunciation: [sɪrˈkʋi ˈzɑntfoːrt]; known as Circuit Park Zandvoort until 2017) is a motorsport race track located in the dunes north of Zandvoort, Netherlands, near the North Sea coast line. There were plans for races at Zandvoort before World War II: the first street race was held on 3 June 1939. However, a permanent race track was not constructed until after the war, using communications roads built by the occupying German army. Contrary to popular belief John Hugenholtz cannot be credited with the design of the Zandvoort track, although he was involved as the chairman of the Nederlandse Automobiel Ren Club (Dutch Auto Racing Club) before becoming the first track director in 1949. Instead, it was 1927 Le Mans winner, S. C. H. "Sammy" Davis who was brought in as a track design advisor in July 1946 although the layout was partly dictated by the existing roads. 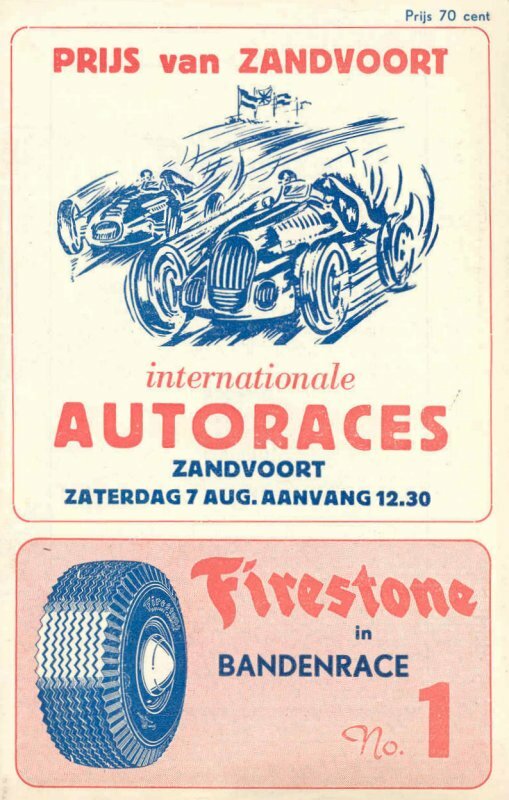 The first race on the circuit, the Prijs van Zandvoort, took place on 7 August 1948. The race was renamed the Grote Prijs van Zandvoort (Zandvoort Grand Prix) in 1949, then the Grote Prijs van Nederland (Dutch Grand Prix) in 1950. The 1952 race was the first to be run as a round of the World Drivers' Championship, albeit to Formula Two regulations rather than Formula One regulations like all the Championship Grands Prix that year; a similar situation also applied to the 1953. There was no Dutch Grand Prix in 1954, 1956 or 1957, but 1955 saw the first true Formula One race as part of the Drivers' Championship. The Dutch Grand Prix returned in 1958 and remained a permanent fixture on the F1 calendar (with the exception of 1972) until 1985, when it was held for the last time. To solve a number of problems that had made it impossible to develop and upgrade the track, the most important one being noise pollution for the inhabitants of the part of Zandvoort closest to the track, the track management adopted and developed a plan to move the most southern part of the track away from the housing estate and rebuild a more compact track in the remaining former 'infield'. In January 1987 this plan got the necessary 'green light' when it was formally approved by the Noord-Holland Provincial Council. However, only a couple of months later a new problem arose: the company that commercially ran the circuit (CENAV), called in the receiver and went out of business, marking the end of "Circuit van Zandvoort". Again the track, owned by the municipality of Zandvoort, was in danger of being permanently lost for motorsports. However, a new operating company, the Stichting Exploitatie Circuit Park, was formed and started work at the realization of the track's reconstruction plans. Circuit Park Zandvoort was born and in the summer of 1989 the track was remodeled to an interim Club Circuit of 2.6 kilometers (1.6 mi), while the disposed southern part of the track was used to build a Vendorado Bungalow Park and new premises for the local football and hockey clubs. In 1995, CPZ (Circuit Park Zandvoort) got the "A Status" of the Dutch government and began building an international Grand Prix Circuit. This project was finished in 2001 when, after the track was redesigned to a 4.3 kilometers (2.7 mi) long circuit and a new pits building was realized (by HPG, the development company of John Hugenholtz jr, son of the former director), a new grandstand was situated along the long straight. One of the major events that is held at the circuit, along with DTM and A1GP, is the RTL Masters of Formula 3, where Formula Three cars of several national racing series compete with each other (originally called Marlboro Masters, before tobacco advertising ban). A noise restriction order was responsible for this event moving to the Belgian Circuit Zolder for 2007 and 2008. However, the race returned to its historical home in 2009. Circuit Park Zandvoort played host to the first race in the 2006/07 season of A1 Grand Prix from 29 September–1 October 2006. On 21 August 2008, the official A1GP site reported that the 2008/09 season's first race has moved from the Mugello Circuit, Italy to Zandvoort on the 4–5 October 2008 due to the delay in the building the new chassis for the new race cars. The Dutch round moved to TT Circuit Assen in 2010. A1GP bankrupted before its fifth season and the Dutch round was replaced with Superleague Formula. In November 2018 media brought the news that the Formula One racing organisation has invited the owners of the Zandvoort race track to make a concrete proposal to stage a Grand Prix race in 2020. In March 2019, it was confirmed that a letter of intent had been signed between Zandvoort and Formula One Management to stage the Dutch Grand Prix, but that it was dependent on private funding being secured to cover hosting the race. A deadline of March 31 2019 was set for a final decision to be made. The circuit gained popularity because of its fast, sweeping corners such as Scheivlak as well as the "Tarzanbocht" (Tarzan corner) hairpin at the end of the start/finish straight. Tarzanbocht is the most famous corner in the circuit. Since there is a camber in the corner, it provides excellent overtaking opportunities. It is possible to pass around the outside as well as the easier inside lane. This corner is reportedly named after a local character who had earned the nickname of Tarzan and only wanted to give up his vegetable garden in the dunes if the track's designers named a nearby corner after him. On the other hand, many different stories about Tarzan Corner are known. The elevation difference is 7.92 meters (26.0 ft). The main straight during the A1GP. In the history of the circuit, several fatal accidents have occurred. Hendrik Dik March 22, 1952 Dik's Peugeot did not stop after completing the stage, but went straight on through some fences. The car then hit a small hill and rolled. It was later determined that Dik had suffered a fatal heart attack at the wheel of his car. Wim Gerlach June 10, 1957 Wim Gerlach rolled his Porsche during a sportscar race at Zandvoort on 9 June 1957. The car was not equipped with a rollcage and Gerlach, who was not wearing seatbelts, had his head crushed between the door of the car and the earth bank. The corner where the accident occurred was later named the Gerlachbocht. Werner Engel April 30, 1958 Crashed his Mercedes 300SL cabriolet during the final stage of that year's Tulip Rally. As was usual at the time, the Tulip Rally's final stage was run as a race at Zandvoort, but in anti-clockwise direction, so as to counter unfair advantages for drivers with racing experience of the track. Engel's car crashed and overturned on the back-stretch of the track, on the short straight leading away from Tunnel-Oost (in the direction of Scheivlak corner) and came to rest upside down on the track. Ian Raby November 7, 1967 Seriously injured on 5th lap of the Zandvoort Grand Prix, 7th round of the 1967 European Formula 2 Championship. Chris Lambert July 28, 1968 Lambert was killed after he collided with Clay Regazzoni during the Dutch round of the European Formula 2 Championship, launching Lambert's Brabham BT23C over the guardrail and onto the pedestrian path below. Piers Courage June 21, 1970 The suspension or steering in Courage's car broke on the flat out 'Tunnel Oost' section. Instead of rounding the bend, the car went straight on into the steep dunes, disintegrated on impact and caught fire as the engine broke away from the monocoque; automatic fuel-sealing equipment was not yet being used. During the impact one of the front wheels broke loose and hit Courage's head, taking off his helmet (wheel and helmet came rolling out of the cloud of dust simultaneously). It's assumed that Courage was killed instantly (or at least severely wounded and knocked unconscious) when the wheel hit him, rather than dying in the subsequent fire, as the monocoque was upright (not upside down, as is often stated by those who confuse the Courage and Williamson accidents) when it came to rest and did not seem to trap its driver in any way. Roger Williamson July 29, 1973 Williamson lost control of his car due to a suspected tyre failure during the 1973 Dutch Grand Prix and crashed into the barriers, spun upside-down and caught fire. David Purley stopped his own race and tried unsuccessfully to save Williamson. The circuit was poorly prepared and not enough extinguishers were on hand. Rob Slotemaker July 29, 1979 Slotemaker was killed when he crashed his Chevrolet Camaro during the "Trophy of the Dunes" touring car race. His car spun on a patch of oil and collided with a course car parked alongside the track. Despite the relatively minor force of the accident, he suffered a broken neck and died instantly. A section of the circuit, the left-hander after Hunzerug, is named in his memory. Hans-Georg Bürger July 20, 1980 Crashed in his Tiga F280-BMW at Scheivlak corner during the warm-up for the Grote Prijs van Zandvoort, the Dutch round of the European Formula 2 Championship. He succumbed to his head injuries in hospital two days later. Alain Vinckx May 25, 1987 During a World Record Day event Vinckx was killed when he attempted a stunt in which he drove a Chevrolet Camaro through four buses placed back to back. The second bus was positioned too low, the roof of the car was cut from it by the roof of the bus. Vinckx was unable to duck away from danger and was decapitated. Oliver Heimann March 30, 1991 Heimann was unable to avoid the car of another competitor which had come to a standstill. Heimann broke his neck in the accident, and he died in a hospital in Haarlem, Netherlands, about one hour after the crash. Henk Schoorstra July 29, 2010 After colliding with another car, Henk Schoorstra's single-seater went out of control and crashed into the guard rail between Hunserug and the Rob Slotemaker bend. The driver was able to drive the car into the run-off area but it caught fire and Schoorstra was killed at the scene. David Ferrer September 2, 2017 During the Historic Grand Prix Zandvoort Ferrer crashed with his March 701 from 1970. The accident happened in the Arie Luyendijkbocht where he lost control of the car and crashed into the barriers. Marshalls got him out of the car and Ferrer was brought to a hospital, where he later died due to his injuries. In August 1959 a 26th World Championships Road Race (men) was held here. André Darrigade of France won the 180 mi (290 km) race, Tom Simpson (Britain) was 4th. Since 2008, the course has been used as the venue for the Runner's World Zandvoort Circuit Run, a 5-kilometre road running competition. The 2010 edition of the race attracted Lornah Kiplagat, a multiple world champion, who won the ladies 5 km race. On 25./26. May 2013 starting 3 p.m. a 24-hours cycle race open for public for soloists and teams up to 8 was held. On 13./14. June 2015 (12:00) the Cycling Zandvoort – 24-uurs race over 4307-m-laps took place. ^ "Grand Designs: John Hugenholtz". Grand Prix View. 5 October 2010. Retrieved 6 October 2010. ^ Diepraam, Mattijs (Summer 2001). "The quintessential race track in the dunes". 8W. forix.autosport.com. Retrieved 6 October 2010. ^ "Motor Racing Programme Covers: 1948". The Programme Covers Project. Retrieved 3 February 2018. ^ "Masters to return to Zandvoort". autosport.com. 2009-01-23. Retrieved 2009-01-23. ^ "Dutch delight". a1gp.com. 2009-08-10. Retrieved 2009-08-27. ^ "Organisers invite Zandvoort to draw up Formula 1 Grand Prix plan". dutchnews.nl. 2 November 2018. Retrieved 3 November 2018. ^ Smith, Luke (2019-03-04). "Zandvoort only option for F1 Dutch GP return". crash.net. Retrieved 2019-03-04. ^ "Circuit Park Zandvoort, The Netherlands". a1gp.com. n.d. Retrieved 2009-11-01. ^ "8W – When? – 1973 Dutch GP". Forix. Retrieved 11 May 2012. ^ "Driver dies after Historic F1 crash at Zandvoort". motorsport.com. Retrieved 11 September 2017. ^ "World Championships Road Race". www.procyclingstats.com. Archived from the original on 28 September 2017. Retrieved 5 September 2015. ^ Runner's World Zandvoort Circuit Run. Runner's World Zandvoort Circuit Run. Retrieved on 2010-03-28. ^ Laarhuis, Andra (2010-03-28). Kiplagat makes successful return after injury . IAAF. Retrieved on 2010-03-28. ^ "Buitenland". Archived from the original on 2016-03-04. Retrieved 2015-09-05. Buitenland – Cycling Zandvoort, Retrieved on 2015-09-05. ^ "Result of Cycling Zandvoort - 24-uurs race 13 - 14 June 2015" (PDF). www.raceresults.nu. Archived from the original (PDF) on 4 March 2016. Retrieved 2015-09-05. Wikimedia Commons has media related to Circuit Park Zandvoort.